The corroded lump gave no clue at first. But as it was dipped in the water and the brush gently moved across its surface, bits of rust fell off and it revealed itself - it was the remains of a Roman brooch. 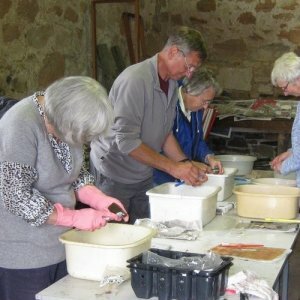 scrubbing scores of pot sherds, broken clay pipes and unidentifiable objects that might or most probably might not have significance fell away as excitement and enthusiasm took over. The chill of the shed and the draught from the open doorway that wafted round wellie-clad legs was forgotten. Dirt-smeared rubber gloves were stripped from cooling hands to examine the object more closely. Imagination started to play its part in those few minutes as it passed from hand to hand. The centuries vanished. Two thousand years had passed since the owner lost it. Since then and until now, it had passed through the hands of only one other person, the field walker who had found it. This was a Bow brooch, made of copper alloy. The pin that had fastened it to its owner’s cloak was lost, perhaps in antiquity and it may have been discarded once it was no longer usable. Its sinuous curve was now pitted with corrosion. What decoration it might once have had vanished over its time in the ground. The presence here in the 21st century invited speculation over its existence two thousand years ago. How had this small artefact arrived in this place to be in its owner’s possession? What trader had penetrated this far north bringing wares to sell to the people of this region? That this happened, hints at acquisitiveness, adornment and leisure, a counter-agent to what we might think was a harsh and demanding way of life. In what part of the Roman Empire had it been made? Who had bought it? Was it a present? And who had been its owner? It was a simple brooch, perhaps of not much value at that time, but valuable to the person who had had pride in the possession of it. It may have lifted the appearance of the owner’s clothing and when it was lost or when it broke, the feelings of its owner may have been those of regret. The centuries rolled away. There was a link here, a bridge between me and that unknown person who had delighted in a transient possession. Finds washing and the fragments of two copper alloy trumpet (bow) brooches found. Brooches of this type were manufactured from around 75AD to 175AD but continued to be worn into the 3rd century.